Two words that feel as good for the speaker as the listener are thank you. Showing gratitude is respectful and so necessary in a relationship. In case you've forgotten to say just how thankful you are for someone special in your life, I found a video clip for you to share with them. In fact, it might help you catch up on a full range of unspoken emotions. thank you. from Hana Davies on Vimeo. As I was growing up, my family was not big saying things like "thank you," "I love you," or "good job." Feelings were left unstated, but expected to be understood. I have to say, the out loud, overt way is much more satisfying and much less mysterious. Thank you for reading this blog. I appreciate the time you take to share optimism and explore my sometimes random thoughts with me. I love this picture. It was posted by Barbara Jacoby for the Canton-Sixes Patch in Georgia. She was promoting, rightfully so, the winner of the Georgia District-Optimist International Communications Contest for the Deaf and Hard of Hearing where Teasley Middle School student Caleb Blair won a $2,500 college scholarship for his presentation on "How my optimism helps me overcome obstacles." I love the picture for what it symbolizes: a young man, standing behind a banner of the Optimist Creed, talking in his language (ASL) about optimism. That's a powerful image. Congratulations to Caleb and thank you to all contestants who participated in the Optimist International Communications Contests for the Deaf and Hard of Hearing this year. The Wanted is the subject of Music Sunday at Experience Optimism today featuring the popular "Glad You Came." It's a perfect song for the end of a school year, the beginning of summer and Memorial Day all in one. What makes it perfect? Youth. And the promise of what is to come. What plans do you have for the summer? Wrapping up the year with the annual Youth Appreciation Awards, the Optimist Club of Salem, Oregon made its final choices for most improved students last week, just in time for the end of the school year. The 10 students receiving awards were - Front row left to right: Lily Emerson - McNary, Megan Angstrom - Blanchet, Rachel Wright - Salem Academy, Courtney Johnson - McNary, Nathan Smith - Salem Academy; Back row left to right: Kate Rosen - Sprague, Edgar Jimenez - McNary, Victor Sosa - McNary, Keri Bonn - McNary, Floyd Thomas - West Salem. 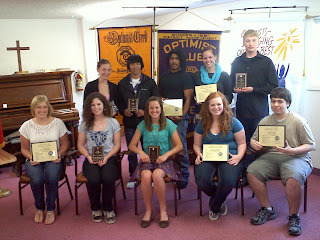 The Salem Optimist Club recognized students each month during the 2011-2012 school year bringing youthful ideas and dreams to share with the club members. Cathie Smith LoCicero moved to Scottsdale, Arizona last year and immediately set to work to start up a new Optimist Club. Reaching out through social media channels that included Facebook and Meetup, in conjunction with her positive outgoing personality, the Old Town Scottsdale Optimist Club was born. 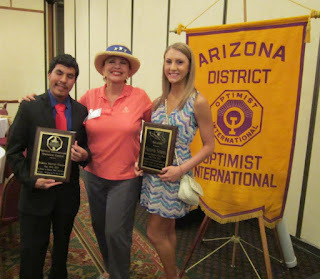 Not quite five months later, this club is honored to announce that two students from contests sponsored by the Old Town Scottsdale Optimist Club are winners of the district level event and $2,500 scholarships. 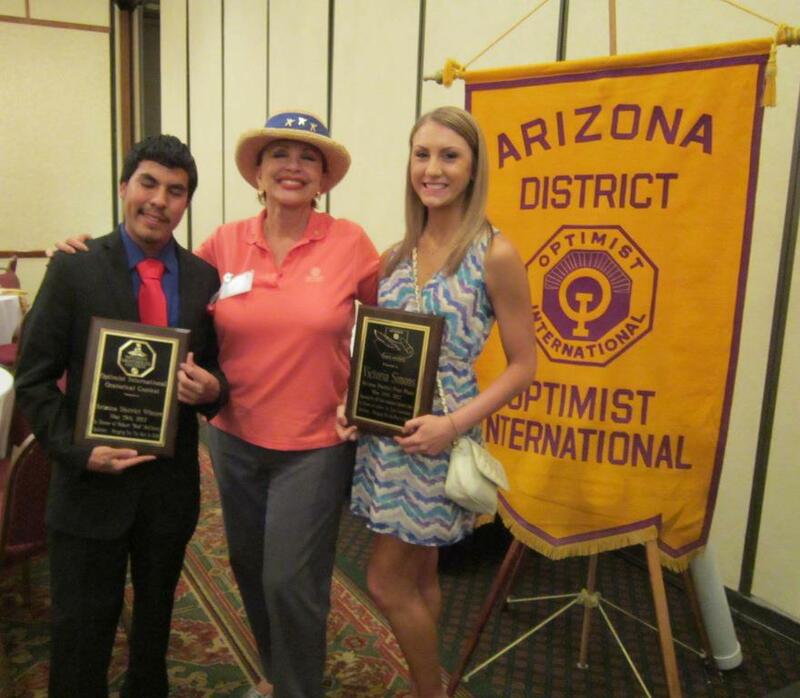 Cathie announced on her Facebook page, "TWO winners at Arizona State Optimist District scholarship awards. Our Isaac M won for his fantastic Oratorical presentation on his troubled youth & comeback & Victoria S for her heartfelt Essay on how one person can make a difference!" I am especially touched by this accomplishment because without this club, these students may not have had the chance to compete and excel. I've watched Cathie engage with her community; her enthusiasm is contagious. She shares optimism every day. Congratulations to all on your success. Music Sunday at Experience Optimism gives me the opportunity to listen to new songs, revisit old favorites, and often, like today, recognize the creativity of artists. Today's song "Somebody that I Used to Know," by Gotye has received an interesting cover from the group Walk Off the Earth. Five musicians playing one guitar is well worth the view, plus the vocals are spot on as well. I watched the original, but much preferred the five solemn faces with the eerie melody to the ephemeral body painting of Gotye and Kimbra. Interpretations can be so personal for they evoke memories, arouse old feelings or desires and sometimes inspire us to reach for something that before may have been out of our reach. Living within a creative community inspires more creativity and optimism - the willingness to try. Creative communities also inspire respect. When we accept that there are many ways to look at a piece of art, interpret a story, sing a song, or design a building, among other things, we demonstrate kindness and love. With three district tournaments having already been played in South Florida, Tennessee, and Atlantic Central and with two more events being held this weekend in North Carolina and British Columbia, I think we can say the race to the 2012 Optimist International Junior Golf Championships (The Optimist) is on. 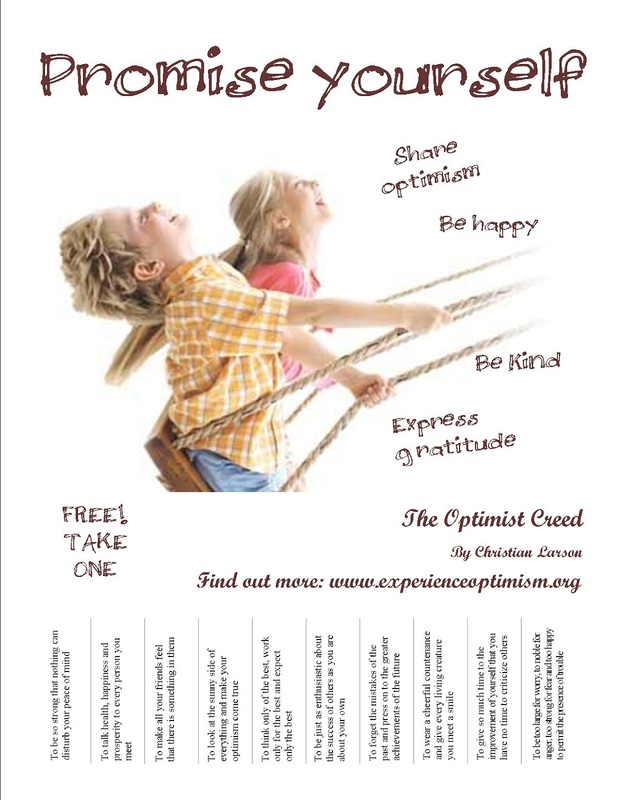 The Optimist takes place near the end of July each year. With more than 5,000 junior golfers participating in qualifying tournaments each year, The Optimist has developed into one of the largest and most prestigious junior golf tournaments in the world. While there are some at-large entries and international players, about 600 junior golfers qualify by advancing through club and district level tournaments in North America. 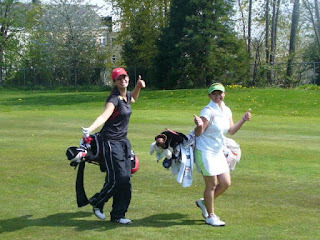 Like all Optimist Club programs, the Optimist International Junior Golf Championships is designed to give children of all abilities the opportunity to participate. However, it goes a step further by ensuring those golfers with outstanding skills have the opportunity to test themselves against other outstanding players from around the world at The Optimist. Only those meeting qualifying criteria are eligible to advance to the big show where they are treated to clinics, entertainment, lots of food and new friends, and the opportunity to play at the PGA National Resort & Spa in Florida. Optimist International is largely known for the great projects performed by Optimist Clubs on a local level. However, the Optimist International Junior Golf Championships is a major event on the junior golf circuit that spans our district, state, province and country boundaries. It teaches discipline, diplomacy, and friendship and highlights achievements. Most of all, it is another avenue to share optimism with the world. My apologies for my rather stilted, press release style of writing today, but I wanted to get the word out about the tournaments and it seemed the most efficient way to do that was to follow the Optimist Junior Golf lead. 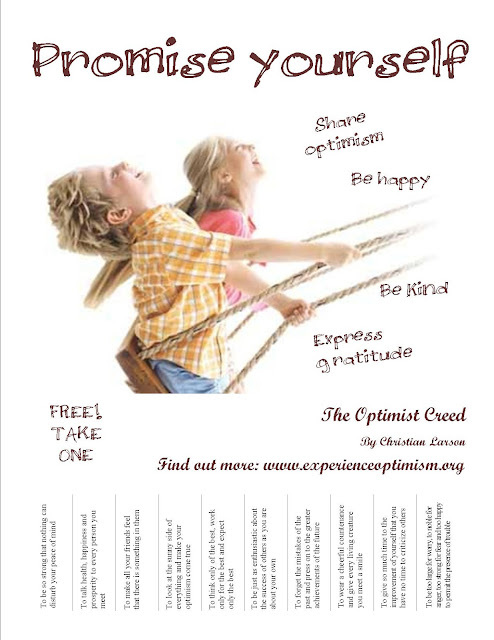 Find out how you can be a part of the The Optimist by joining Optimist Club today. Junior golfers, please find a tournament near you at this link: http://www.optimist.org/e/juniorgolf/qualify2.cfm. Do you know who the ultimate optimists are? Mothers. Every day, 24/7, they hope for, work for and expect only the best for their children and families and when the nucleus is nurtured, the whole body flourishes. Mothers do all of that with love. For Mother's Day at Experience Optimism, I hope you enjoy this simple message along with The Beatles and "All You Need is Love." 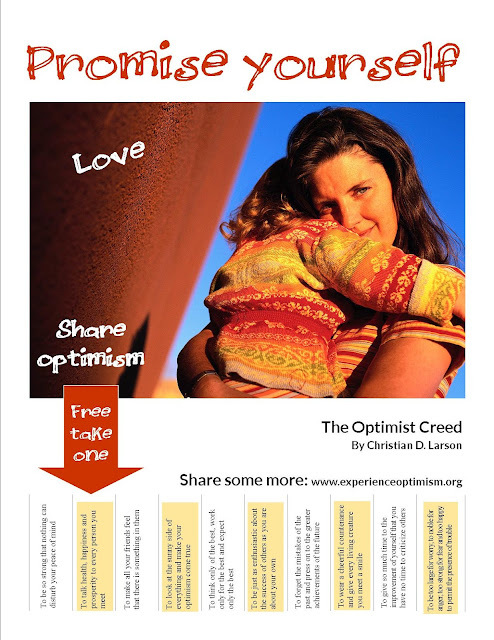 Share optimism and you share love. I learned that from you mom. Happy Mother's Day. I thought about many good words to share with you today such as tolerance, understanding, awareness and acceptance, but on further reflection, it occurred to me that none of those words are needed when there is respect. Therefore today's message is respect. Respect should be given to all people, ideas, places and things. Respect should be two-way and automatic. I'm not one who buys into the concept that respect has to be earned for that implies a hierarchical culture where someone is always passing judgment from above. I wouldn't want that job; would you? I do believe, however, that respect can be lost and that happens when one fails to learn from their experiences, avoids growing up or conducts themselves in a way that would harm others. It also happens when the words, "We agree to disagree," are uttered. Disagreement is not respectful. Disagreement denotes unresolved conflict and conflict left unattended breeds disrespect. On the other hand, respect breeds confidence, shared goals and dreams, and happiness. 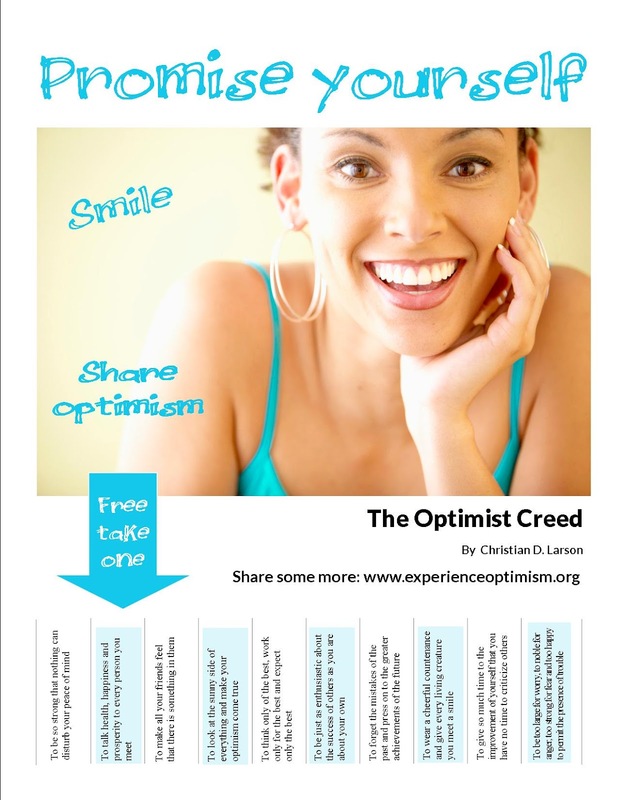 When we are happy, we are optimistic and that allows us to share optimism with others. My goal this week has been to help you explore ways to increase your optimism and then to share that optimism with others. If you follow my suggestions for living optimistically you will most assuredly lead a virtuous life. William Arthur Ward said, "Feeling gratitude and not expressing it is like wrapping a present and not giving it." That's why today's message, like all messages this week, is not merely about feeling, it is about doing. In other words, don't just be grateful. Express your gratitude, say 'thank you' and mean it. If I might share a word of caution, please don't be indiscriminate in your thankfulness for that takes meaning away from it. I once had a supervisor who would say to me, "Thanks a ton," about everything I did. I fully believe that he thought he was showing appreciation, but in my mind, there was no acknowledgement of special effort for I received the same level of praise even when I performed below my expectations. I doubt that any of us work for praise. However, the right amount of praise, at the right time, sure goes a long way. It is the optimistic thing to do. Share your appreciation and soon you'll realize that you are sharing optimism too. When I considered the message that I wanted to share with you today, my mind went straight to flowers for the graphic display. Depending on when they are given, flowers might symbolize love, hope or respect. They might be a sign of sympathy or gratitude. Flowers are even used to say I'm sorry. Tending to flowers in a garden requires a gentle touch and enjoying them growing in the wild suggests a gentle nature even in the gruffest of characters. I don't think there is any doubt that each of those actions are done with kindness. However, before I was able to post my thoughts, I saw the following quote on Twitter, attributed to B.D. Schiers, "Kindness is the greatest wisdom." I'm always amazed at how the right words, ideas and actions appear just when you need them. I incorporated those words right into my Share Optimism message today. Be kind and just like a flower, your optimism will unfold and blossom. Now go ahead and share that feeling with friend. Use this poster to share optimism today. Wednesday is known in some circles as "hump day" signifying that the work week is at its midpoint. Being the optimist that I am, I'll refrain from saying that it is half over. However, depending on your attitude, the week can still drag on as you anticipate how you'll spend your time off with family and friends. Don't do that. Don't wait for the weekend to find joy in all that you do, for if you do, you'll miss out on the happiness that every day brings. Optimism begins with a smile. Happiness begins with enthusiasm. Both are contagious and your friends, family and coworkers are ready to be infected. 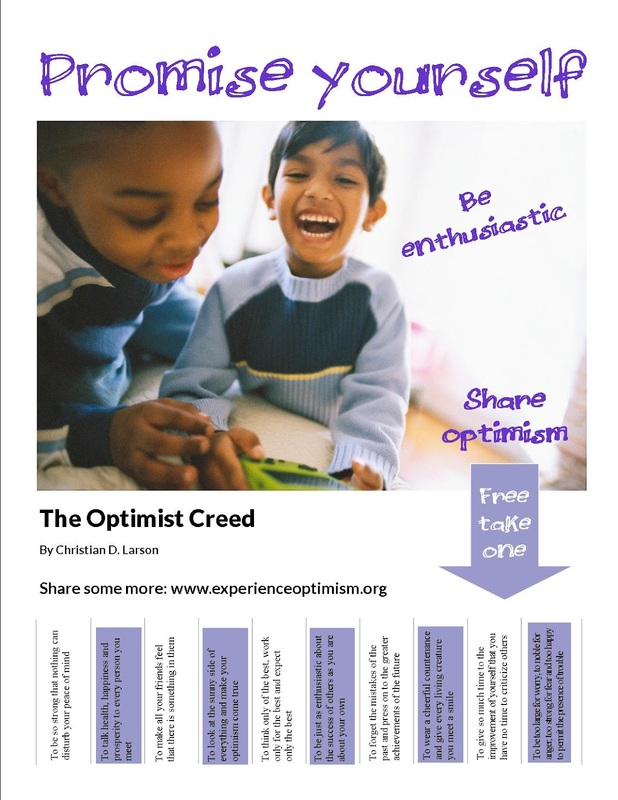 Go ahead, be enthusiastic and share some optimism now. You are probably looking at the computer screen thinking something like, "Yeah right," or maybe even, "I don't feel like smiling." If so, please try this right now: Look right into the screen and smile. Did you feel the muscles in your face relax? Did your body shift ever so slightly to accommodate the relaxation? Recent studies from the Carnegie Institute of Technology have shown that EQ (emotional intelligence), MQ (moral intelligence) and BQ (body intelligence) are equally important as IQ in engineering a successful life and career. I propose that success starts with optimism and it is easier to be optimistic when your whole body is smiling. 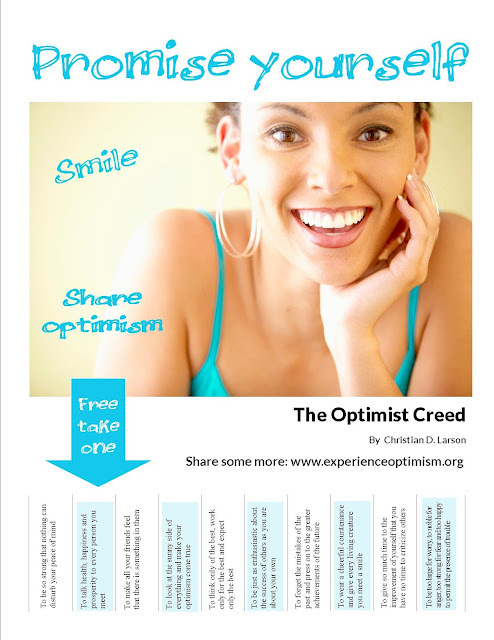 Practice that smile; feel and share your optimism. Now. Happy Monday, my friends and readers. This week, I plan to share optimism with you every day via a new poster with tear-off quotations from the Optimist Creed. It's a visual way to keep the positive emotions flowing. 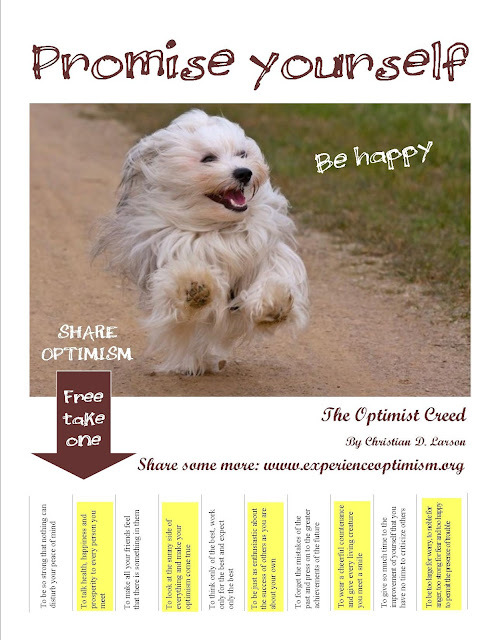 Won't you share some optimism today? Pin it on Pinterest, share it on Facebook, and post it on Twitter. Better yet, print it and post it on a bulletin board where others can take a part of Optimist Creed along with them on their journey. Today's message: Be happy. My posts and thoughts this week and last have had a great deal of personal emotion tied to them even though I haven't necessarily conveyed that in my messages. When I heard this song, "Use Somebody," performed by Pixie Lott, the melody tapped that emotion that I've felt and not expressed. Sometimes we need an outside influence to bring such things to the surface so that we may move forward in a positive way. Tomorrow represents a new week and a time to start fresh by living every day to its fullest. I'm putting all the angst behind me with this installment of Music Sunday at Experience Optimism. If you have any bad memories of the week, I invite you to put them to rest now as well. 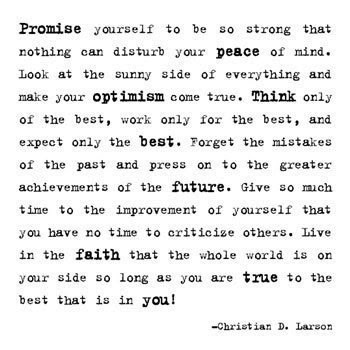 In the words of the Optimist Creed, it's time - let's press on to the greater achievements of the future. 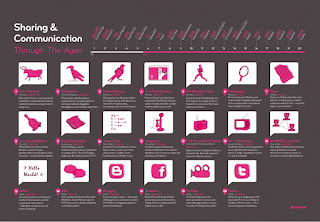 I was thinking about writing this post yesterday, well before I saw this graphic depicting communication styles through the ages. Provided by moo.com, one can see that we have long shared stories and that those stories have been largely accentuated by pictures, beginning with, you guessed it, cave paintings. My take on the picture and infographic medium is much less historic. Actually, it might even be considered a rant. You see, some of my Facebook friends have become oversharers of tacky pictures embedded with motivational sayings, unbelievable claims, political and religious messages and jokes, both good and bad. Sometimes I want to scream at them to please stop; and sometimes I just smile or shake my head. Always, I move on. Putting my rant aside, it should be fairly easy to grasp that the old saying, " a picture is worth a thousand words," is alive and well and living in the social media sphere. Service clubs like Optimist International, Rotary, Kiwanis and Lions are just beginning to accumulate written stories about the good deeds that are performed by their clubs and club members around the world. I was wondering what would happen if they were to give up on the collection of stories and publish pictures instead? Pinterest has grown on the premise that the pictures are the story. While I am still undecided on the ethics or legality of pinning and repinning what may be copyrighted material, I started a few pinboards because one can't understand the issues if she only participates from the sidelines. But what if the aforementioned organizations, and others, were to generate visual content and then extend the rights to republish it with attribution to their members? Think of the great awareness that would snowball through the ranks of the organization and around the world. Pictures evoke emotion. Organizations, especially service clubs, thrive on the emotional connection that members have with its purpose. As potential members, we want to see what it looks like to be involved. As members, we want to have our positive feelings reinforced. As advocates, activists and recruiters to our causes, we want content to share and the easier that content is to share, the better. Pictures, as Facebook and Pinterest have confirmed, are easy to share. 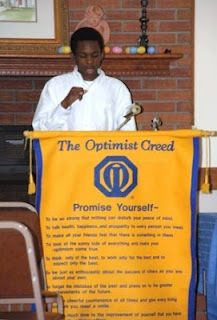 Optimist Club members know the power of the Optimist Creed. It builds hope and inspires us every day to do more, be more, and achieve more. It is also a strong magnet to bring new members into our clubs. I know that I enjoy associating with positive-thinking people, don't you? 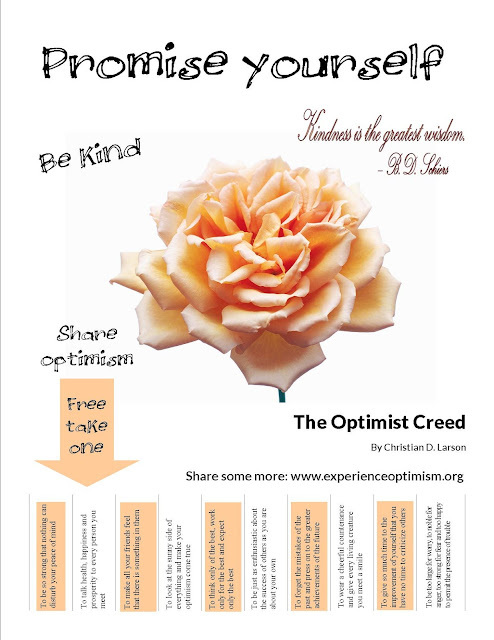 Here's an idea that I hope you share with your Optimist Club as a way to reach out in your community. Rip off and duplicate this poster (I borrowed the idea from kindovermatter.com on Pinterest.) Add your club contact information and then post on your social networks, email to your club members and friends and if you dare, use the old fashioned way of pinning them around town. Grocery stores, universities, libraries, bookstores and car washes are just of the facilities that still have bulletin boards for community news. 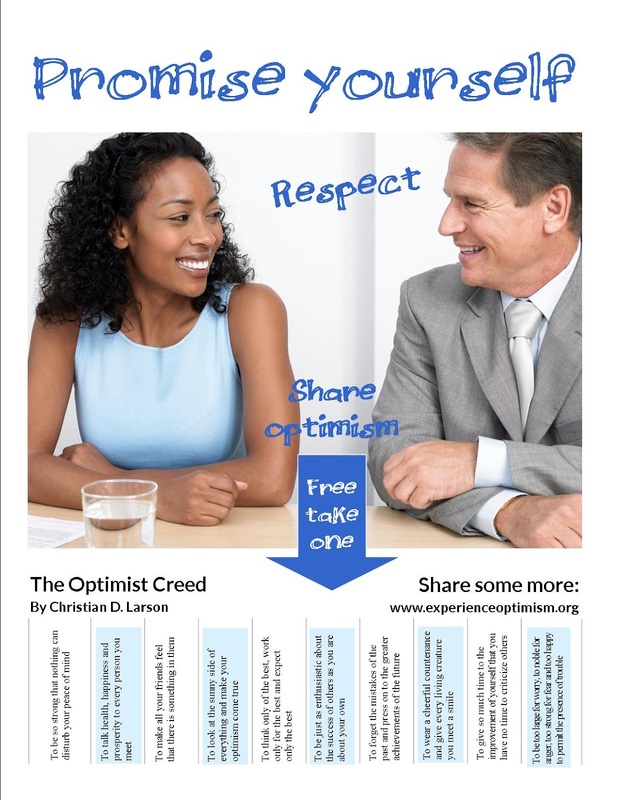 The Optimist Creed is loved by everyone. Promise yourself to share it with others today.